We have 300 head of these heifers for sale. 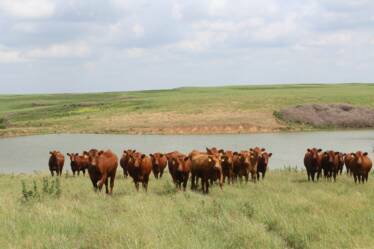 Certified Red Angus bred heifers from the H&F Red Angus Cattle operation out of Pieper Red Angus genetics, and Leland Red Angus. Heifers were bred to easy calving with performance genetics bulls. Bred A.I. to LSF SRR REDEEM 4103B, and pasture exposed to LSF SSR CONQUEST 3313A, PIE Rambler 194, PIE NUF SED 3034, HPR NORSEMAN KING 9725, HFR SEQUOYA 1889, AND HFR CONQUEROR 3536, MUSHRUSH Trojan C178, and Nebula D172. Heifers are on native grass until the first of October and then will be preg checked again by a licensed Veterinarian, and will be ready for delivery by the middle of October. Ultrasound preg check breeding dates and pelvic measurement records on individual heifers will be available to buyer. All heifers were DNA tested (Stayability, Maternal Calving Ease, Tenderness, Percent Choice, RFI-Bos Taurus) and checked to be BVD PI negative. Sisters to these heifers bred to the same genetics earned the 2010 and 2011 Red Angus Association Grid Master award. Check out on the next pages what our genetics will do for your operation.